Welcome to the Barony of Dun Carraig. Dun Carraig is the Southern Maryland chapter of the Society for Creative Anachronism (SCA), a non-profit educational organization dedicated to hands-on study of the Middle Ages and Renaissance. We learn about history not just by studying, but also by doing. At our events, we dress in clothing from the time period. 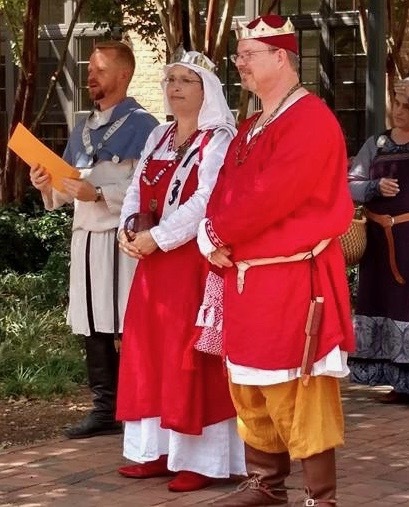 At SCA events, you can eat a medieval feast, shoot archery, dance, watch tournaments, listen to songs and stories around a campfire, and take classes about everything from Viking battle tactics to Elizabethan jewelry. SCA members study and recreate all aspects of our time period (roughly 600 to 1600 C.E.). Members make armor, jewelry, clothing, shoes, pottery, glassware, and weapons. Some study medieval recipes and create sumptuous feasts; some brew beer, mead, and wine. As we like to say, if it was done in our time period, someone, somewhere in the SCA is recreating it. Everything except dying of the plague, that is.